B.C.’s Carrier Lumber has carried out a number of improvements to its Tabor sawmill near Prince George, the latest being the installation of a large log processing line made up of USNR equipment. The installation of a new large log processing line is just the latest in a series of major improvements at Carrier Lumber Ltd.’s Tabor sawmill in Prince George, British Columbia. The line is designed to process wood in the 9.5 inch to 25 inch diameter classes. It complements a line introduced earlier for material up to about 9.5 inches diameter. Both the large and small primary breakdown lines are made up of USNR equipment. 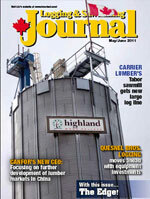 Carrier Lumber has operated a permanent sawmill at its Prince George location since 1964. 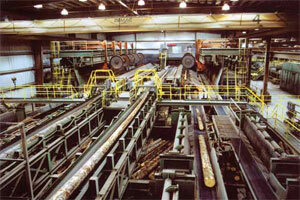 It is one of the largest and most successful independent sawmill operations in B.C. and also runs a mill in Prince Albert, Saskatchewan. Production varies with market demands but the Prince George mill cuts dimension and stud lumber in a range of sizes from eight to 20 foot lengths, primarily for overseas markets including Japan and China. 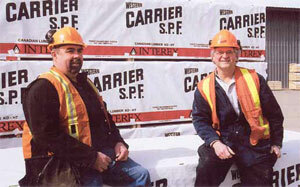 Carrier typically operates on a two daily shift basis. “We believe adequate time for maintenance is very important,” notes Kordyban. The new large log processing line is just the latest in a series of major improvements at Carrier Lumber’s Tabor sawmill. The line is designed to process wood in the 9.5 inch to 25 inch diameter classes, and complements a line introduced earlier for material up to about 9.5 inches diameter. Most of the logs entering the sawmill do so across one of the two merchandising decks. One handles off-highway log lengths to about 80 feet, while the other deck caters to the approximately 60 foot logs consistent with highway load. Cut to length and material shorter than 20 feet can bypass the merchandisers and enter the mill separately. The merchandiser decks are equipped with Linden quadrant feeders and both the large and small lines have banks of Linden cut-off saws. The two Nicholson A8 debarkers—22 inches on the small line, 27 inches on the large—are equipped with dual rings and have counter rotating capabilities. Both are reportedly working well. Kordyban notes Carrier is typically among the best chip quality providers for Canfor Corp’s. pulp mills. Additional sorting capacity is provided by three bins on the small line side and two on the large. Kordyban points out the bins are useful when mill flow dictates diameter sorting, to reduce setwork variations downstream. The optimized USNR small log line features dual scan zones for auto log rotation and primary breakdown. Included is a slew/skew infeed, canter and quad arbour saw box. Logs are re-scanned before entering a vertical shape saw with 3-D digital tri-cams. Kordyban notes the line’s curve sawing capability is essential in small wood to help the mill meet its lumber recovery objectives. The newer USNR large log line includes auto log rotation and a quad roll log turner with rotation verification and correction. Kordyban says Carrier worked with USNR to test and refine the rotation verification system. 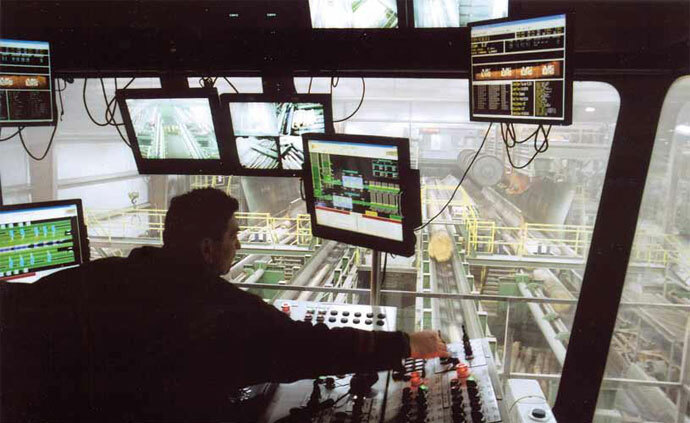 Every efficient sawmill is a work in progress and upgrades in one area can influence product flow upstream and down, so Carrier deliberately adopted a phased approach toward introducing its mill improvements. The large log line has an extended length infeed with skew/slew/tilt capabilities, again to improve recovery at the four sided canter. At the time of the Logging & Sawmilling Journal’s visit, the skew/slew/tilt function was working well within its capabilities at a random length log piece count of around 15 per minute. The line also incorporates a flare reducer which, says Kordyban, helps logs better settle on the chain. An unusual feature is the line’s two quad arbour saw boxes with pivoting top heads. They offer variable kerf sizes for producing side boards and offer the additional flexibility of back-up if one box is down. The entire line is PLC controlled. 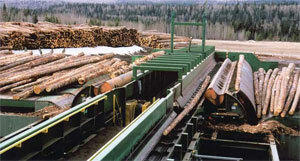 The new line and work associated with it was installed while the rest of the sawmill continued operating. Indeed, throughout the industry downturn, Carrier has kept producing lumber and its people always had a job. Near the mill, the company operates its fab-shop, a 75,000 square foot machine centre under one roof. The centre allows Carrier to fabricate its own equipment—transfers for the sawmill upgrades, for example—as well as test run machines. The company has established working relationships in the growing mining industry and in the oil patch for custom machine work using its equipment, expertise and building. The initiative gives Carrier an alternate cash flow source. Improving lumber recovery from available timber supply was a key motivating factor during Carrier’s round of sawmill improvements at its Tabor operation, says Bill Kordyban, Carrier’s president, (at left in photo, with sawmill co-ordinator Kelly Solmonson). Improving Carrier’s Tabor operation began at the mill’s back-end several years ago, recalls Kordyban, with the dry kilns and upgrades in the planer. Four of the operation’s five dry kilns were replaced with Wellons kilns. The older kiln remaining continues to do its job on assigned charges. Now, with the two USNR breakdown lines performing well, attention is reverting to the mill’s back-end. The challenges there will likely be addressed by Carrier in similar fashion to the two log breakdown lines. “It’s about good equipment and focused people,” declares Kordyban.